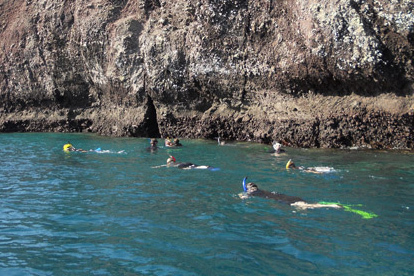 Six hundred miles off the coast of Ecuador, five great ocean currents converge on the Galápagos Islands. Two of them, the Cromwell and the Humboldt, bring an upwelling of cold, nutrient-rich water that supports vast concentrations of plankton and in turn an abundance of sea life. Were it not for these natural phenomena, the currents and plankton, you might never have heard of Charles Darwin. And I might never have experienced an epiphany of the Planktonic Unconscious, the numinous progenitor of all awareness that may someday point the way to a genuine community of mind and a better understanding of our place in the world. [Left] Five major ocean currents converge at the Galápagos archipelago. 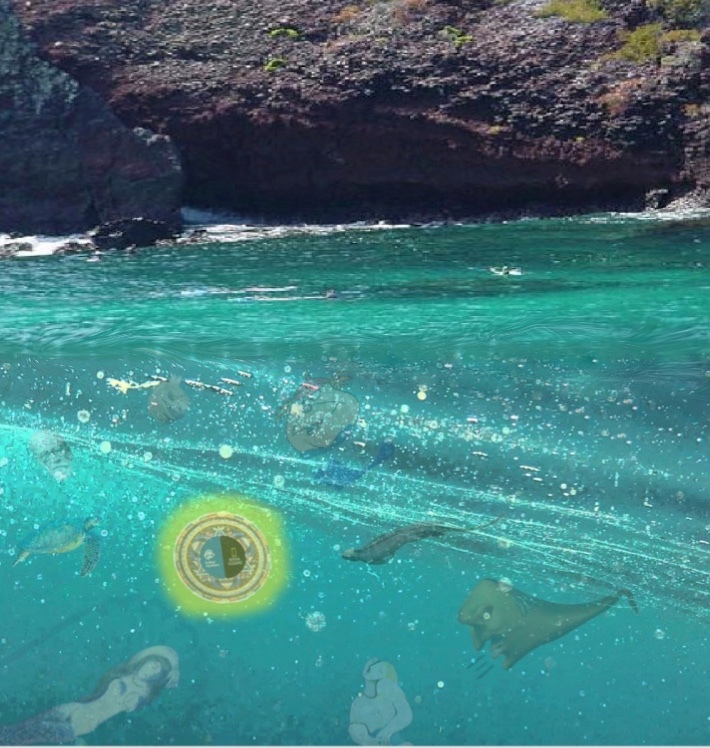 nutrient-laden water that supports vast concentrations of phytoplankton. But first a little background. In the popular imagination, the Galápagos are seen, and rightly so, as a microcosm of evolution, a showcase for the biology of natural selection, or as Darwin précised it, the origin of the species. A volcanic archipelago of some 21 islands and assorted islets straddling the Equator, formed between 8 million and perhaps up to 90 million years ago, the Galápagos are known for their extraordinary number of endemic species – with most of the aboriginal biodiversity, remarkably, still extant. 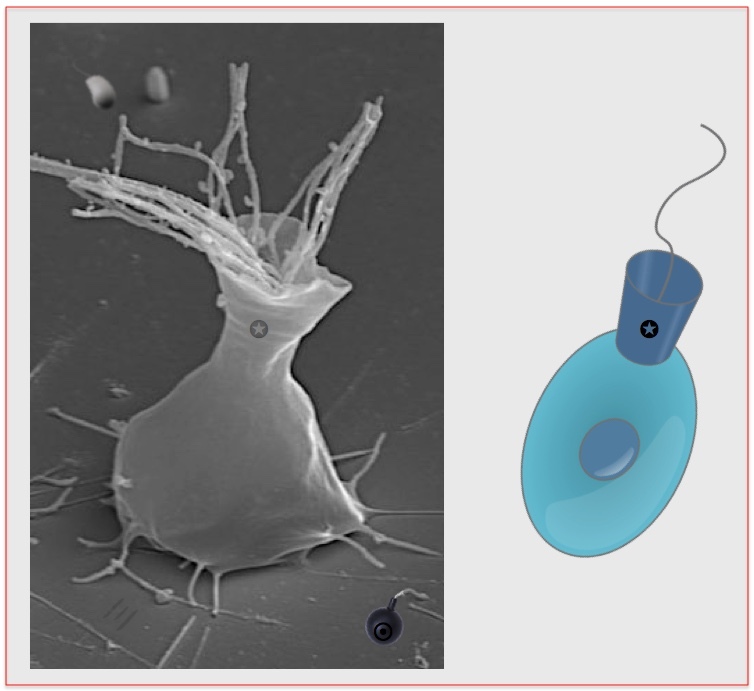 a biological basis for the Planktonic Unconscious. A famous example of this, the Galápagos finches, has been the subject of a 30-year research project that, for all intents and purposes, has shifted Darwinism from the realm of theory to that of scientific fact. Studying large and medium ground finches on Galápagos’ Daphne Major, Princeton biologists Peter and Rosemary Grant documented changes in beak size driven over time by fluctuations in specific natural selection pressures. 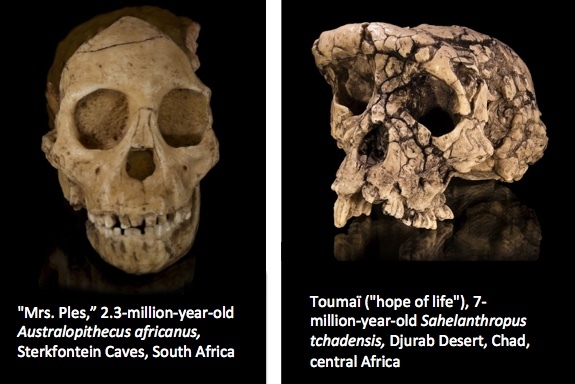 As some have put it, their unprecedented observations caught evolution in the act. But the islands are much more than a mere showcase for science. There is also about them an aura of the preternatural, as though they represent one of those sacred natural sites that to folks of many beliefs are mystical, imbued with spirituality. Yet what about the Galápagos creates this impression? To begin with, there are the islands’ ancient reptiles. The giant tortoise dates back to the Upper Cretaceous (70-80 million years), and the marine and land iguanas, to the Miocene (8 million years). Although the marine iguana is typically vegetarian, its appearance is so unnerving you might be scared sacred if you ran into a big one after dark – an iguana of the night, so to say – especially, if it were to make a play for you. Then there’s the harsh, ascetic beauty of the landscape itself. Although a few of the islands have ecological zones that progress from dry to humid as one moves from coastal areas into the highlands, most are flat and barren with little more than sparse stands of saltbush or cactus for ground cover. 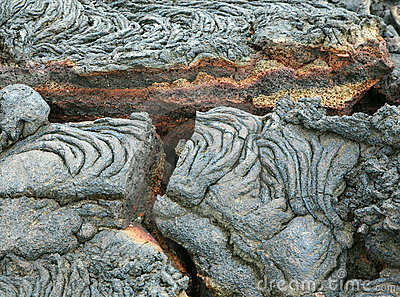 Cooling magma has left lavas of almost kaleidoscopic variation (due to oxidation of iron), ranging from shiny black to red, yellow, or dull brown. Lava fields vary from a ropy smoothness with dark whorls and ripples like chocolate pudding to apocalyptic-looking escarpments of jagged, rust-colored volcanic clinker that might well call to mind Dante’s seventh circle of hell. Yet nowhere perhaps did my apprehension of the uncanny wax so pronounced as in the waters fronting a sheer volcanic rock face plunging vertically into Gardner Bay off Española. A zodiac from the National Geographic Islander brought us here on day #2 of the expedition for an initial go at snorkeling. It seemed straight forward enough at first, but once in the water, I found to one side of me trackless ocean, and looming on the other, a grim precipice of adamantine lava that fain would thwart, it seemed, even the most desperate attempt to make land. It was as though I’d fetched up in some out-of-the-way purgatory, a place of final reckoning from whence there could be no escape. A frisson of panic swept over me. But I quickly banished these fears by dunking my face mask-first in the drink – sort of like burying one’s head in the sand except that unlike sand, the ocean is sure to offer you striking new scenery. 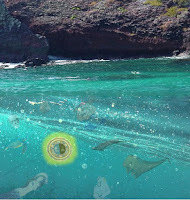 And, striking the scenery was, too – foraging sea lions pirouetting after sardines; blue-footed boobies and pelicans diving on unwary prey, trailing torrents of bubbles from where they’d breached the surface; a four-foot hammerhead patrolling in the gloom deeper down. And then there were the plankton, so much plankton, like a dense primordial soup, a rich bouillabaisse of tiny marine organisms swirling in every direction, reducing visibility to but several feet – conjuring for me, it seemed, a vision of the very beginning of things, the rise of the élan vital or life force that animates all Nature. For a time I lay enraptured, spellbound by the foggy spectacle, barely breathing through my snorkel – and might have remained that way for untold minutes, maybe hours, had not a impertinent mackerel startled me from my reverie. Clambering back aboard the waiting zodiac, which had been following us like a shepherd with a flock, our party motored back to the ship. bloom of the ocean’s plankton. Later, over lunch and a Harvey Wallbanger I fell into deep contemplation. 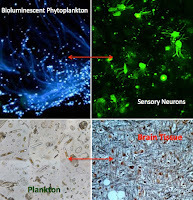 It occurred to me that owing to evolution, plankton today, unlike their ancient ancestral prototypes, might well be playing host, not just to primitive ion fluxes but to a great deal more besides – that is, to an actual ecto-cerebroid collective or planktonic unconscious (unconscious, of course, because plankton don't really think all that much). For at sometime in the remote past, from a condition of primordial unicellular bewusstlosigkeit, there must have sprung the first inklings of cryptic nescience that over eons evolved into a full-blown collective unconsciousness of plankton – how else could one explain it? contribution to the global carbon cycle. 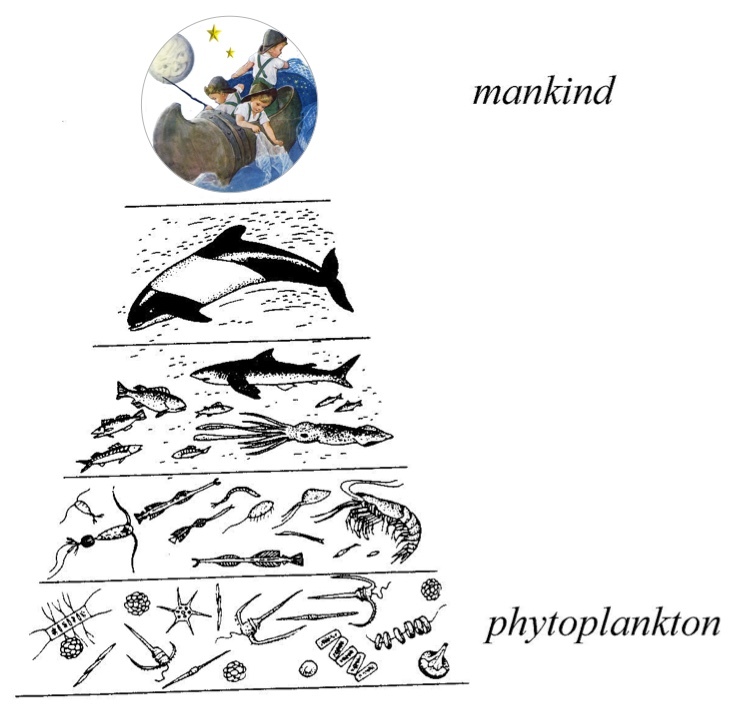 evolution of the Planktonic Unconscious. Though happening over a vastly different time scale, these events probably occurred in much the same way that the images of a motion picture, springing from the projector (think brain), resolve into focus on the screen. While the projector (or brain) is quite real, the images that emanate from it are not, even though on screen they might appear so. They’re merely representations of things. 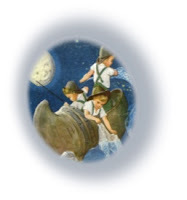 By the same token, consciousness is not real; it’s merely a projection or representation of one’s potential for dealing with oneself, with others, and with one’s environment. The same might be said, for example, about energy: energy is not a thing in itself but merely a representation or projection of the capacity for doing work. If consciousness, therefore, is unreal, unconsciousness must perforce be real! To pursue the analogy to its conclusion, then, the Planktonic Unconscious like our movie projector is real yet gives rise to the condition of consciousness that is imaginary and malleable. It surely follows that plankton hold a very real potential for molding our future awareness if only we remain open to their influence. We must listen to plankton! Well, just consider the facts. In aggregate, plankton make up 98 percent of the ocean’s biomass and produce 50% to 85% of the oxygen we breathe. 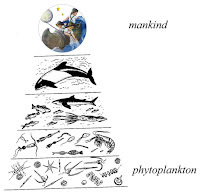 Taken together, phytoplankton (plants) and zooplankton (animals) form the very basis of the marine food chain, sustaining echelons of life that finally lead to us, mankind. Gaging that such a potent natural force might also influence the workings of mind seems almost a no-brainer. Although more encounters with plankton amongst the islands were to follow, none reprised the epiphanic wonder of the first, and all too soon it was time for me to leave. As I disembarked the Island Explorer at Baltra for an Avianca flight to Guayaquil, I came upon a sea lion snoozing on a park bench not far from the dock. At first I though better of disturbing her, but still filled with the zeitgeist of the place I made bold to speak. The sea lion opened one eye and gazed at me for a moment. She gave a great sneeze, expelling salt granules from the special glands in her nose that allow sea lions to cope with their salty marine environment. I wish to acknowledge comedian Jerry Lewis who can prattle on brilliantly in what sounds for all the world like French or German without uttering a single real word of either language, and likewise les Jacques, Derrida and Lacan, who (in their cases, presumably unbeknownst to themselves) did much the same thing. I acknowledge that this exposition may be sexist in that it privileges plankton, organisms that thrash about like spermatozoa, over organisms that don’t.